I was recently inspired by the quote above. It got me thinking about how our manners should be a thoughtful reflection of our overall character. While we all of course experience our “off days,” we should not let these affect our overall attitude toward others and our manners. Whether it is a coworker, loved one, or a stranger, do not take out your frustrations on them. If a waiter gets your order wrong or store clerk gets you the wrong item, do not get angry at and embarrass them. Instead, be polite and kindly ask them to re-do your order. Traveling and way-finding in new settings induces stress on many people. When asking for assistance or checking-in with security or travel personnel, ask for things politely and always thank them after. Avoid a demanding tone and short response. Loved Ones can be an easy target for taking out frustrations – If you know you are in a bad mood or have had a rough day, let them know you may not be in the best of moods and ask for their understanding to help you. If you know you need some alone time, simply let them know that. Taking things out on coworkers can be detrimental to your career, professional appearance, and overall office/team moral. If you are having a bad day, keep your composure and breathe before responding to situations. It is better to wait and think than to react inappropriately and have to apologize later. And always remember – Even when you are having a tough day, smile at others as they pass you and offer a kind greeting. You may not always get a smile or greeting in return, but at least you will know you presented a friendly face to another individual! Moving Day, Grab the Crew! With a large number of individuals relocating during the summer, the ever popular “moving season” is upon us! Moving can be a stressful time with a “To Do” list that seems to grow by the second. To help reduce some of the stress, many people will hire movers to help with the process. How can you use movers to have the best move possible? If you have elected to have your movers pack your belongings, be clear about what you want packed and have those things organized. As the movers are packing the boxes, this is not the time to start throwing things out. Schedule time for yourself to “de-clutter” prior to the day the movers arrive to pack your boxes. If you are packing yourself, have everything packed and staged for the movers prior to their arrival. If the movers arrive and you are still packing boxes, this will delay their work and be an inefficient use of their time. Ensure you provide the moving team with the correct address for both locations. Also, if there are special instructions for parking, loading dock location, or elevator usage, ensure you provide this to the team ahead of time. Everyone is nervous about moving (mainly hoping nothing breaks), but this does not mean you should hover over your moving crew. If you have boxes or items that are fragile and need special attention or packing instructions, let your movers know this ahead of time and be sure to point out those items on moving day. Have water and/or sports drinks to hand out to the movers, especially if they will be working in the extreme heat of the summer. Should I tip the moving team? Tipping your movers is much like tipping waitstaff at restaurants, you base it on job performance. If you are happy with the job, tip the team. If you are unhappy and had problems throughout the job, you do not have to tip. How much should I tip the movers? In contrast to tipping waitstaff, it is more popular to tip movers a flat amount rather than a percentage of the moving cost. However, this amount will vary based on the extent of the move. Remember to individually thank and tip each mover! Do not hand an overall sum to one mover. In lieu of tipping your movers, you can treat them to lunch. If you decide to do this, ask them their meal order! To everyone moving this summer, enjoy your new homes! This article is not related to protocol or etiquette; however, I found this experience so special, I knew I had to share it. This Holiday Season, I had the privilege of being the Program Manager, or “Head Elf” as some affectionately referred to me, for USO-Metro’s Project Elf. Project USO Elf supports military children of junior enlisted service members, E-1 to E-5, by pairing them with Corporate and Community Wish List Donors who sponsor the children. These Wish List Donors buy the children gifts from their Wish List for the Holiday Season. This year, I am very proud to say USO-Metro supported over 1,200 military children in the Washington-Baltimore Metropolitan region! While this program was quite an undertaking, coordinating 1,200+ Wish Lists between 2 distribution locations from hundreds of Wish List Donors proved to be no small feat, it is one of the most rewarding experiences I have ever had. Planning for the program started as “Christmas in July” and gained momentum throughout the Fall. The build-up to the program was amazing! On October 1st, the “North Pole” began receiving Wish Lists from children. The notes I read honestly made my day several times. One of my personal favorites was for a 6 year old girl, “She is girly and happy go lucky, very artistic, loves play dates and gymnastics! She has asked for: stuffed Hello Kitty doll, silver pageant crown & wand, ribbon baton twirler, Frozen Anna dress, sparkly silver Mary Janes, Melissa and Doug craft projects. She also likes Chick-Fil-A, My Little Ponies, and fun sparkly colors of Zoya (nontoxic) nail polish.” How adorable is that?! That is just one of the over 1,200 Wish Lists I received that reminded me of the pure joy and excitement the Holidays bring to children. Come November, Wish Lists were distributed to Donors and they were set loose to hit the stores while I stayed at the North Pole organizing the program logistics! As soon as December 1st hit, I spent the first week of the month on “Sleigh Stops” visiting our Corporate Wish List Donors and receiving hundreds of Wish Lists from several companies. The level of excitement I saw in these donors and the giving atmosphere the companies built around my program was incredible. One company even had so many employees want to give to the program, that the employees started buying popular gifts for us to add to other children’s gift bags saying, “the more the merrier!” Once all the Wish Lists were collected, my amazing volunteers set-up and decorated the distribution sites. Project USO Elf Distribution Site #1 with over 800 Wish Lists ready for service member pick-up! Project USO Elf Distribution Site #2 with more than 400 Wish Lists ready for service member pick-up! When distribution night arrived, I was instilled with an overwhelming sense of calm. That day, I knew all the hard work and long hours I put in were about to pay off – big time! Seeing the smiles and hearing the words of appreciation from service members who received gifts for their children was the only “Thank You” I needed. Realizing we (I would be remiss if I did not thank my amazing USO-Metro teammate and our HUGE volunteer corps. Without the volunteer hours put in by these dedicated, patriotic individuals, my job would not have been possible) had really made a difference in the lives of others was incredible. This year, the Christmas spirit has not quite “taken hold” of me in my personal life. However, today I realized when over 1,200 military children wake-up tomorrow morning their Christmas wishes will come true thanks to so many generous citizens who wanted to give back and say “thank you” to our service members. Personally, the opportunity to play Santa for these military children has been a privilege and truly an honor. This year, Christmas took on a new meaning for me. I hope to continue to pay it forward to those so deserving of this special program. To learn more about Project USO Elf, please watch Elizabeth Prann’s Fox News coverage of Project USO Elf. For additional photos from Project USO Elf, please visit the USO-Metro Facebook album. This week, part one covers financials. 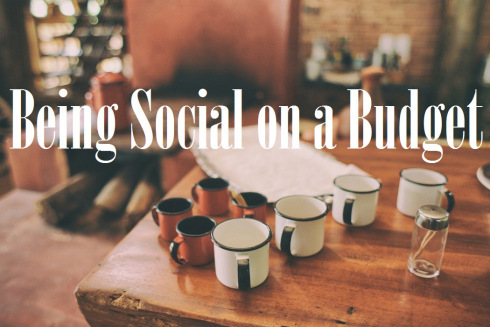 In no way do I mean to be a financial adviser (I do not have a finance degree 😉 ), but I do have experience with “having a social life on a budget.” So, I am sharing my tips on how to maintain your social life while on a budget! If you know a celebration is coming up (someone’s birthday, an anniversary, the holidays), put a little money aside each pay period to save for gift giving. Taking a trip soon or want to plan a trip? The same thing applies – set your money aside early in the pay period so you can gradually save and treat yourself to the vacation you deserve! Not only will your credit score thank you, but so will your stress level! Keep a calendar with due dates of bills and/or put reminders on your phone for exactly which day of the month your bills are due. This will ensure each of your bills is paid on time and serves as a helpful reminder to set money aside when you know a bill is coming. A lot of companies now offer automatic payment online. While this is a great idea, it is still your responsibility to ensure the payment went through and there is enough money in your account to cover the payment. NOTE: If you set-up automatic payment, always check the amount withdrawn to ensure you are being charged the right amount. Have you been looking forward to a night out? An easy way to save your money for the weekend is to pack your lunch during the week rather than eating out. You can also make your own coffee in the morning rather than taking your normal coffee shop run on the way to work. It is truly amazing how quickly all those little expenses add up to quite a chunk of change! Rather than driving somewhere and paying for gas and parking, see if public transportation is available or if you can set-up a carpool. If you are really looking to save more, consider cutting out some luxuries to give yourself a bit more freedom in other places. For example: If you have cable that gives a million more channels than you ever use consider downgrading your cable package. Keep a record of your income and your spending. The best way to start changing your finances is to realize just how much you really do make versus how much you are actually spending. By keeping a log of how much you spend and what you spend your money on, you will be able to identify areas where you can save! Most cities have a plethora of free attractions, museums, and monuments which anyone can visit. In DC, a great blog to follow is Free in DC! You can even find exercise classes and outdoor activities if you are looking for a discounted way to workout. Attend happy hours when drinks and food are discounted. Sign up for the rewards cards at your local grocery store and pharmacy/drug store – it can really save you a lot! If you are mindful of what you are spending and make an effort to save a bit each pay period, you will begin setting yourself up for financial success. While all these cost saving tips are helpful, make sure you find a good balance between cutting costs and treating yourself. It is OK to treat yourself once and a while, especially when you know you have saved for it – That is the whole point of the work-life balance! Enjoy your social life and keep doing things with friends and loved ones! As a Program Specialist for a nonprofit organization, I rely heavily on my volunteers to ensure my programs run smoothly and to help me engage with our public. From preparation activities to program day, volunteers make my programs possible! So, what makes a great volunteer? Here are my thoughts on the characteristics of a volunteer you want on your team! 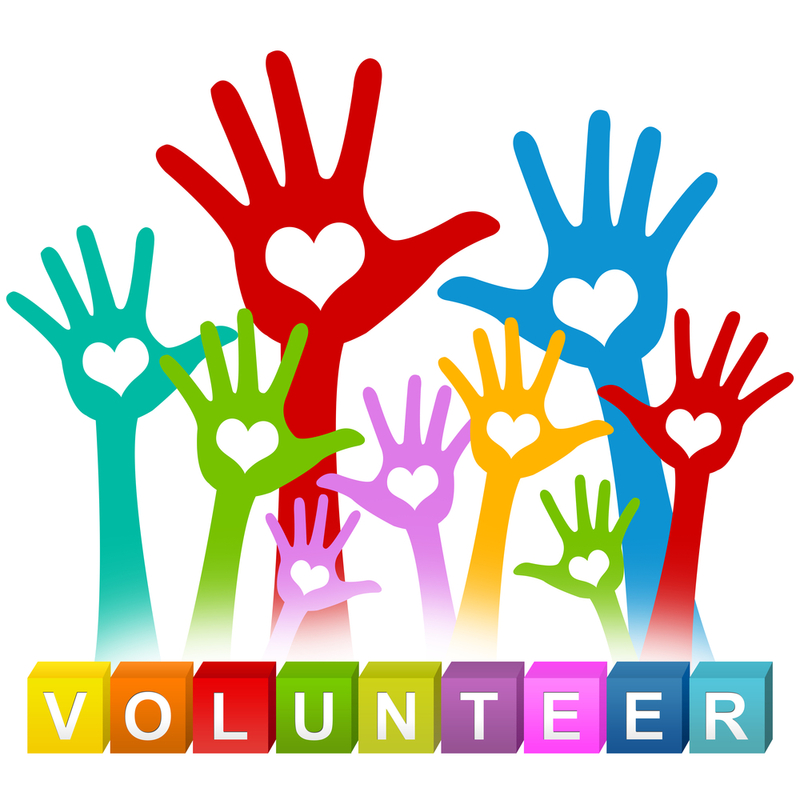 Volunteer for a cause you are passionate about! Volunteers who truly relate to the cause they are supporting, will enjoy engaging with the individuals benefiting from your program and be enthusiastic about what they can contribute to the cause/program. A “no job is too small” attitude is a must! From taking out the trash to helping with set-up and break-down of an event, a volunteer who is willing to help out wherever support is needed is essential. Not all jobs are “glamorous,” but they do support the greater cause and that is what is important to keep in mind as a volunteer. This goes hand-in-hand with “up for anything.” Be a volunteer who is proactive and willing to jump-in when you see something that needs to be done – just be sure to follow the procedures laid out by the Program Manager. Educate yourself about the mission of the organization and the goals of the program so you can speak to about them intelligently when asked by a participant, sponsor, or even a friend considering volunteering! Depending on the organization’s and/or the program’s mission, sensitivity to an individual’s personal information and reason(s) for participating in a program can be very important. Ensure you safeguard people’s privacy when volunteering with sensitive causes. Now get out there and volunteer in your community for a cause you are passionate about! Take a Tour, A Wine Tour! As Spring gets into full swing and the weather allows for more outdoor activities, I know many of you will be off to the vineyards for wine tastings! For those of us (including me!) who are not wine connoisseurs, wine tastings can be intimidating if you are not knowledgeable of the different types or what you like. Wine tasting is the perfect time to learn! Here are a few tips to get you ready and help craft you into a wine expert! Schedule your wine tasting ahead of time especially if you are in a large group. This helps wineries plan for guests and assign you the correct number of wine hosts. Plan your transportation. You will be drinking so be sure to have a designated driver or get a limo/party bus/etc to take your group to and from the wineries. Dress the part 🙂 While wearing something more casual is certainly appropriate, I would at least wear nice jeans and a pretty top (for ladies) and a polo or casual button down (for gentlemen). Depending on the weather, sun dresses are an excellent option! Many wineries have indoor/outdoor tasting areas and/or places to eat so be cognizant of your options. Additionally, some wineries are more casual than other. Do your research and look up the winery prior to your tour. Avoid perfumes, creams, and hair products with overpowering smells. A part of wine tasting is being able to smell the aromas. If you have too much perfume, etc. on it will interfere with the experience. Give the wine host (the person who describes and pours the wine) your full attention. This is the perfect time to learn more about wine, how it is made, and about the winery/vineyard itself. The wine host will give a thorough description of what to expect from the wine and why it has certain flavors. Often times, you will also be told what foods go well with each type of wine you taste – This is important to learn so you can be an excellent host/hostess and pair your wine with what you serve! When in the tasting room/area, keep your voice to a conversational tone. There are typically several parties in the area; therefore, you do not want to be the loud group everyone stares at because they cannot hear amongst their own group or worse, hear their wine host. Be aware of how much you are drinking. During a wine tasting, you are given a small amount of each wine. You may not think you are drinking very much, but it starts to add up over multiple wines/tastings. Be classy and avoid the embarrassment of drunken behavior in a refined setting. Hold your wine glass by the stem. It is not only proper to do so, it is also practical. When drinking white wines they are typically chilled; therefore, putting your had around the globe of the glass will warm the wine. Red wines are enhanced by exposure to the air so having a wider globe helps this process. Hold the glass by the stem for red wines as well. What if I do not like a certain wine? If you know beforehand that you do not care for a particular wine, simply place your hand over your glass when the wine host gets to you and say “no thank you.” The wine host will understand. This way is much more appropriate and discreet than exclaiming “I do not like that wine” to your host and the rest of your group. Eat before you arrive or plan a meal in conjunction with your tasting trip. At most tasting, small snacks of crackers and/or cheese will be set out. These are simply to cleanse your palette between wines, not to act as hors d’oeuvres or a meal. Wineries are a great place for a picnic! 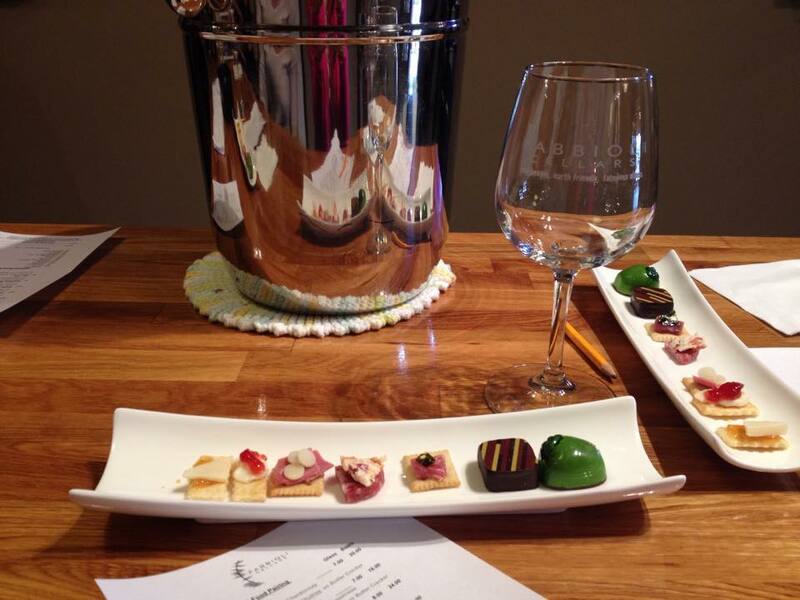 If you have selected to do a wine and food pairing, then you will be given food, but it will be small, bite-size samples of each course. Remember: Sip. Taste. Sip. This allows you to taste the wine on it’s own first then taste it again after eating to see how the food influences the flavor. Do I have to buy a wine after a tasting? While it is encouraged to do so, you are not obligated to buy any wine after a tasting. If you do find you like then by all means go for it! Have you ever had a wine etiquette dilemma? I hope these tips help you feel more confident as you explore the world of wine! As part of Week 2 of The DC Ladies Blogtober, today’s writing prompt is your “Favorite Back to School Memory.” My mind immediately went to picking out my first day of school outfit, prepping my Lilly Pulitzer agenda, organizing all my school supplies, and anxiously reading through my syllabi. Those are certainly a few of my favorite back to school activities, but my ultimate favorite back to school memory was moving back in with my roommates after the summer break! Today, I am sharing my tips on how to be a good roommate. If you are going to invite people over or have guests stay overnight/for the weekend, be sure to ask your roommate and let him/her know of your plans. Keep the noise level down – If your roommate is studying, working from home/after hours, or sleeping, do not make a ruckus. If you are watching a TV show or movie, close your door or keep the volume low if you are in the common area. If you are listening to music, use headphones. If you are in the kitchen, avoid rearranging the pots and pans while cooking. Unless asked by your roommate to go get something, do not go into your roommate’s room or personal things. On a safety note: If you do not plan to come home one evening, are going out town, or will be coming in very late, let your roommate know. It is always good to have someone know where you are, but you also do not want to scare your roommate by not showing up or coming in extremely late. This is especially true for the common areas and if you share a bathroom! If you use blankets, pillows, etc. or rearrange the furniture for an evening, be sure to put things back as they were once you are done. Use coasters! It helps to prevent drink stains on coffee and end tables. Share your magazines/books! If you are not going to keep them, put them on the coffee table for your roommates and guests to look at. If you have people over, clean up. If you spill or break something, clean up. No one likes to clean up someone else’s mess. Do not leave things laying all over the countertop. Do not hog all the space on the shower caddy/shelving. Clip your nails over the trashcan. Swifter/Vacuum the floor (especially if you are a girl with long hair… shedding happens). Wash out the sink after you brush your teeth. No one likes dried toothpaste globs! Empty the trash (especially if it’s “that” time ladies). Do not eat food that is not your’s unless your roommate has said you can have some. With that said, if you are making dinner or snacks, ask your roommate to join you for meals! Share your recipes! Clean up your dirty dishes and cookware. Do not leave things sitting on the counter or in the sink for prolonged periods of time. If you use a dishrack instead of a dishwasher, be sure to put your things away when they are dry. A cluttered dishrack does not help your cleaning process. Clean the countertops and appliances after you use them. If you need to borrow a utensil or appliance that is not your’s, be sure to ask first. Make a list of regular chores (taking out the trash, vacuuming, unloading the dishwahser, cleaning the bathroom, etc.) and alternate responsibilities. For common items (toilet paper, trash bags, etc.) and cleaning supplies, alternate who buys it each month (or however often). Before moving in, be sure to discuss who is bringing what. Unless you plan on living together for a very long time, I would avoid splitting the cost for new things. When you move out, it can get complicated as to “who owns what,” especially if it is large pieces of furniture. Do not hang anything in the common area without talking to your roommate first. Before you rearrange the furniture, ask your roommate if he/she has any ideas for a new arrangement. Be culturally sensitive, especially when it comes to the holidays. If you celebrate different holidays, decorate for all of them! Overall, be courteous and remember you are sharing your living space. Do not do anything you would not want done to you or your things. Whether you are in college or post-grad, I hope these tips help you to live succesfully and comfortably with a roommate. Enjoy your roommate and have fun together!